Kristin, you are the bomb. That is all. Bye bye Kristen. This article did it for me. I do not want to be obsessed with writing for ‘success’. What is success, living like you? No thanks. I do not want to be a CEO. I do not want to link back to your blog. Do not put my name in your hat. I write for a purpose but it is not all about me, my career, the markets and production. I have my own goals. They are not the same as yours. I hope it works out for you. Joe, I apologize if this offended you. Was not my intent. I work those hours not for money, but because I truly love helping writers prepare for the career that FITS THEM. One of my favorite parts of the new paradigm is it gives all kinds of authors opportunities to pursue THEIR dreams. If they just want to write a memoir or short stories or a book for their kids, they no longer have to just go through NY publishing. There are new ways to reach the audience they desire, even if the audience is just their kids. But for those who want to write professionally (as in make a living) it is a lot of work. The CEO reference is merely to remind writers that there is a lot of non-writing stuff that will go with the dream (e.g. taxes and updating the web site). It’s easy to be idealistic when we are new. I know I was. But once I had an idea of the professional expectations, I was able to forge a plan that fit MY goals and to better prepare for the business side of working as an artist. Success is different for everyone. I gain great personal satisfaction by demystifying social media and also preparing new writers who want this as a full-time job what the realities of writing as a business are. Best of luck, and again, my apologies. Great post! We all do wear so many hats as writers today. I think it’s important that all publishing paths should be investigated before choosing one. I am a firm believer in knowledge is power. I struggle with a lot of what needs to be done to indie publish. I let myself get overwhelmed with all that needs to be done. I need to learn to look at the small picture once in a while, instead of the big picture all the time. One step at a time! Thanks for all of the valuable information you provide on this blog. An inspiring post for me, especially at this time in my writing life. So much I have read or have had happen to me in the last week or two has related directly to the decisions I am making about what to pursue, what to let go of, where to set priorities, etc. I think the universe has been telling me what you said so succinctly: “Choose a path, then give it all you have.” Thanks. I’ll be linking to this on my FB page and sending it out to my small Twitterverse, too. Great advice, as always. It is true – my longest writing week has been equivalent to my day job week and I cannot wait to manage the pile of work each day. When you find something you are meant to do and love doing it – then ‘work’ hardly touches the sides. There are plenty of challenges and it can be tough, beyond tough (I need my thesaurus – as Friday night brain sets in) it is never easy to jump with your dreams… but without you trying, your dreams will not exist at all. So true! I’m working hard at my own CEO writing hat. Thanks for keeping it real. This is what I enjoy about your blogs- some are informative and others, like today, are inspirational. When one makes the decision to become a professional writer, it is a decision to reinvent oneself to a new career and accept the hardships that go with it. It’s great to have a place to go (WANA) and blog posts to read that help to keep you moving forward. Just what I needed today! Thank you for the motivation. I support all authors, no matter the path. I merely want it to be the path that’s best for YOU. Thank you so much for this. I’ve unsubscribed – reluctantly – from different writing and publishing blogs (self-pub and traditional) because I just couldn’t stomach any more of the zero sum game mentality of the writers there. Self-publishing is just as legitimate as traditional publishing and vice versa, and there’s no one true path to publication. Both contribute greatly to the richness of literature in their own ways, and rather than put the other camp down, we should be celebrating how great it is to be both writers and readers nowadays. My e-reader is chock-full of books from self-published, small press published, and mainstream published authors. So yay there. I really related to this post. One thing that I wasn’t prepared for on my career path was that everything didn’t change and become all sparkly once I published my first novel. In fact, things got harder in a way as I navigated promoting the book, dealing with reviews, and trying to sell the next book. My career is in a bit of a lull right now, but I hang in there because i love to write. “While others are whining, we are working.” YES! I don’t think good things when I think CEO, and for good reason. I’ve rubbed shoulders with many, and the following article validates my experiences and observations. How bizarre that surgeon and doctor are on opposing lists. Interesting though! Um, Willie Nelson might disagree with the accountant. History is filled with accountants laundering money for the mob or all-out ripping off their clients…then taking off to enjoy an island getaway while the clients who trusted them rot in jail for tax evasion. There are plenty of charities that have been investigated (and arrests were made for fraud and embezzlement). Nurses are notorious serial killers (Angels of Death). A shocking percentage of the female serial killers are nurses. Care aids and therapists frequently come under criminal investigation for abuse and neglect, particularly of the elderly and mentally challenged. Just call JAYCO. A good number of teachers have done hard prison time for molesting and sexually victimizing children. And we won’t even start with doctors. There are good people and bad in ALL professions. There are bad CEOs and good, just like anything else. Excellent rebuttal. It is a silly list, but I will say the professions with the higher percentage of psychopaths are honest enough to at least require it as a condition of employment. It is true that some CEOs lie and pretend to be psychopaths when they’re not, but they usually don’t last very long. My brother has become a superb salesman for a Fortune 500, and I have watched him morph into a psychopath, for lack of a better term. How or why did he do this? I guess originally to just pay the bills, and he excelled on picking up on the culture of psychopathy and becoming one with it in order to just survive. I believe he may have crossed the psychological Rubicon by now, meaning there’s no way back, even if he wanted back. I saw the same thing happen with my first fiancé. He landed a job as a sales manager and transformed from a kind and gentle man to a narcissistic psycho. I think it’s why we need to connect with good people. Keeps our moral compasses pointing the right direction :D.
Yep, and let’s not forget to mention the Beauticians/Stylists. They’re some of the worst psychopaths. Case in point, look at how they’ve made old ladies look so identical, you can hardly tell them apart. Everywhere I go these days, I think every old woman is my mother because of these psycho Beauticians. It’s sick & twisted, I tell you!! I’ve pleaded with Mom to just do her hair herself, but no, she’s got to have it done by one of these sly and manipulative stylists, such is the hold they have on this generation. To add further insult to injury, these glorified butchers charge these old ladies for this barbarous cloning. And it’s not cheap! Some elderly women will fork over half their monthly social security stipend just to look like every other elderly woman. But, what can you do? It’s the society we’re living in. Thank you for the inspirational talk. One thing I would love to see (and you may have discussed this at some point), is how much time should one devote in a day to commenting on blog posts and/or other social media especially when one’s email box is flooded with hundreds of emails a day? I think this advice goes for everyone/anyone who is “self-employed” especially in the arts. I’m sending it to my nephew who’s trying to get in a Brooklyn gallery. We have dreams so we know the path we’re to follow in life. That is why I’ll finally be going to college to get my BA in Professional Writing at the ripe old age of 65. My days would be shorter if I didn’t have to regularly interrupt to fight with Nerf swords, change a diaper or fill a Num-Num, LOL. I believe my balancing act of family contributes to the very long work days. Lost of interruptions. But everyone needs to find the right pace and simply appreciate. It IS A LOT OF WORK. Thanks for the lovely reply and all the best! Lot of good quotes in there. New level, new devil – I’ll remember that! You spoke a lot about the victim mentality. For me, the victim mentality is one of the biggest barriers to doing what you really want to do. Steven Pressfield calls it ‘the resistance’. Chris Guillebeau uses a metaphor with monkeys in a cage who won’t go near a well-placed banana. Most people run into this discovery when they travel on this road called life. Very few can name it, like you have – and how others successful have. Once you name it, and take responsibility to manage it, you can move forward in ways other people cannot. I’m not working hard enough. I think I’ll ask my hubby for a “Mommy day” just so I can go to a coffee shop and crank out as much of my WIP as possible. It tickles me that I read your post on a day that I’m home “sick” (coughcough) from my day job. A day I took because I have a conference coming up and I wanted to stay home and polish my synopsis. The more I read from vets in the field, the more I want to try to do this writing thing all day, everyday. Sure it scares me, but its the good kind of scared, like a roller coaster. Kristen, this is such a good reminder. Two things really seemed close to home for me at the moment. Your statement, we must have the courage to do what scares us if we want the dream – I’ve just had an amazing experience marketing and selling my book and I loved every minute of it. The other is the phrase, tiping yourself into alien territory, that is what I’m doing right now with my second book, I’m feeling out of depth, out of my comfort zone but excited, all at the same time. I’m glad teachers are not considered generally psychopathic. Indie or traditional publishing: a black and white choice? Maybe not. I’ve gone indie with a couple of books and I’m set to go trad publishing with another couple (maybe – nothing’s signed yet…). My choice has more to do with the book topics than anything else. My next novel is set in academia which has a select market world-wide but not in the general market or a local market. That one will be indie. And as an aside about workplace psychopathy: the provided list is talking about frequency or likelihood of finding a psychopath (other than prisoners – that’s where you find the most psychopaths and we shouldn’t forget that!). I’ve done some of this research. Yes, you find psychopaths everywhere just like you find saints everywhere, but the likelihood is up in the list provided – and it sounds about right to me…except I’d add politicians to the ‘most likely’ list! Thank you very much for your pearls of wisdom and the very real inspirational gifts you give us every day! Because of your beautiful efforts I’ve nominated you for the Top 7 Blogs That Inspire contest at searchingforthehappiness.com – because you deserve it. I cannot do the traveling and book promotions that paper book INDIE will require to be super successful. It is one reason that I started reading your blog because of the encouragement with the usage in the Internet World. I believe in it and not just because of my situation. More than ten years ago I was prepared to buy a 4-wheel customized van with poop guy (4-wheel just for the month of January snow storms Back Then before Climate Change wars with technology) to go to the conferences and book promotions. But learning of success stories with the Internet, I am making plans to stay home and learning the social media traveling to be successful. I have no problem with sticking my neck out. This is not college where I am being played with and my parents are paying for the fun and games. I do not have to play along with the privileged rich kids with money and I can do what I want, even if the White Rose turns me down for a date and I get blackballed for asking her. The Crescent Girl was dating the son of Zeus. If they yell at me and call me names because I do not sit with them at the cafeteria table, I will not hear it or I can scroll down and read something else maybe even check out another more pleasing website. I would be happy with $2K a month as a writer and I was sent an E-mail of someone making more with self-publishing on the Internet. Hi Kristen, I loved the comment “yes, my Christmas tree is still up” I only took mine down at the end of March and it became a standing joke between me and the hubby. I have certainly have to toughen up on the journey, you get sick of people looks that say get a proper job. I had one friend say to me that I led a charmed life. I said “yes I suppose I do, I am following my dream… but I also do the accounts for my husbands business run a house and work 7 days a week. I work treble the hours I did in my (previous life)high powered job. Apart from being a mother to four children whilst explaining to people who should know me better what a charmed life I have.” *silence* point made back to chit chat no more comments. Awesome post! I’ve been seeing this general expression of the new writing reality the more I research and prepare, and it’s great to see a post that says it clearly but doesn’t leave me feeling sorry for myself. This is the way it is and I’m going to conquer it!! Isn’t that the truth, Kristin! And, really, it sounds an awful lot like life to me. . .. Thanks, as always, Kristen, for the motivating jolt! It is good to know. No matter what coliseum you want to play in, it is good to know the environment and the competition. I better keep writing. Without a product to submit or to self-pub I do not have much of an offense to win at the game. I live with severe arthritis so forget joining the professional tennis circuit for money. I can put up with the pain sitting in front of a desktop computer for a few hours. I have a chance. The best advice to offer any would-be author is that it’s crazy difficult, costly and time-consuming — AFTER your manuscript is D & A (not DOA!) — delivered and accepted. There is a frightening fantasy that getting your book published suddenly changes everything, for the better, forever. As if! It means your first book has to sell a lot of copies so another publisher will take on your second. And the selling of all those books? That’s up to you. What psychopath came up with the notion that guns don’t kill people? Does it take a psychopath to believe guns don’t kill people? Does it take one to know one? Do lawnmowers don’t cut grass? Etc. Psychiatrists say most people have not been diagnosed and are mentally ill. It seems some are diagnosed after the fact. Psycho-iatrists don’t know what insanity is any more. What percentage of those in prison should be transferred to wards for the mentally ill? d) And stop them from getting a gun that does kill people? Boy that was a mouthful! To use a gun to kill people is premeditated murder. First you have to find the bullets where you last hid them from the kids who kept killing your dogs. Then you have to find the gun where your kids hid it thinking that was funny. Then you have to load the gun and hope the perpetrator is still there because you are so mad by now you could kill somebody. You can’t kill the kids because you would be in trouble with C.P.S. and the law. The surviving kids would have to live in a foster home and would be bummed out. Psycho-iatrists have been convinced sociopaths with attention deficit disorder with are normal. They are born that way and can’t get disability payments. Like a spoiled, only child, they require a lot of attention, and if they can’t get their way can destructive, and exhibit bizarre behavior. Psycho-iatrists have Psychiatrists too. I am working on YA high school basketball novel and Paranormal Romance Suspense Thriller planned to be started on May. But this comment would be excellent research for a suspense thriller of a serial killer or even for stopping an assassin novel. It would be good for the F.B.I. profile of the killer. The hero in my YA is an only child. Delivered and Accepted instead of Dead on Arrival – they both sound like titles for a paranormal suspense novel. Ghosts living among us or death but spiritually alive and he solves his own murder or a Heaven Can Wait (first movie) novel I had wanted to write since high school in the mid seventies. I do not have a novel published and I got paid, but my time consuming is spent on writing what I am capable of writing to get an offer. I like learning about the Self-Publishing route however. If I had the big bucks, I would start a Random House. Since I do not have the money, I am writing the novels to make money. It was suggested to just write romance or mysteries and target the genre to have a better chance at success, but my mind would rather go where the thoughts go. I am more likely to complete the novel instead of another WIP to finish someday. It is more important to complete the novel so the focus is to write what I am capable of writing. I’m going the traditional route, but I’m going to approach promoting the book like an indie. I don’t know how much the traditional publishers promote for you, but I think every writer needs to be their own number one fan. Inspiring as always, with a kick of realism thrown in. Thanks for your consistency. Kristen, I have to say when you first started blogging five times a week some of your posts weren’t up to the standard. But now? Wow, quantity AND quality. The last three posts have been extremely interesting. Have you published more books than “are you there blog” and “we are not alone”? I have a new book coming out soon. I was pondering the idea that I would traditionally publish, but after a year and a half of sitting on a book proposal and told to halt any further books, I just gave up on traditional. The fastest they could get any of my books to print was a YEAR. Also, I no longer thought we could be a good fit, so I just wrote the book. 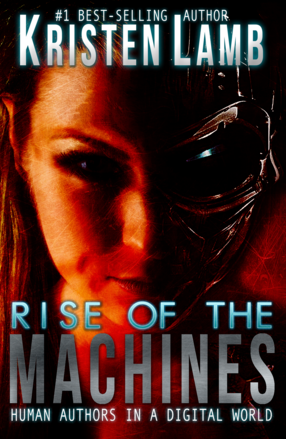 “Rise of the Machines, Human Authors in a Digital World” is going through final edits and cover design. Goal is to have it out some time in May. Sorry you didn’t feel my posts were up to the standard. I was working to write shorter. The blogs were essentially the same, just not all in one post. I wrote the same blogs I always did, just would keep a single point per post instead of doing three or five. I think some people like all the information at once and others prefer it spaced out. I would just wait for the new book. I learned a lot more about blogging, and you are always welcome to give feedback. I don’t take it personally, really. I can’t improve if I don’t know. I just knew the posts were awfully long, so I was working to keep them 800 words or less. Learning curve for sure :D.
Well, I’ll do that, then 😀 Looking emmensely forward to it! I really like how the new world of writers/readers is more interactive where you can follow the writer’s journey, so to speak. And I have to say, your advice about simply jumping into blogging was great. I’ve already learned a lot from blogging, and I’m only at 41 posts! This was great. I’ve always wanted to write and have only started to really give my time to it this past five months. Once I started writing did I understand how hard it was. Not only do I need to get inspiration for my book I have to keep writing and bloging on two different blogs. I’m a bit in awe of how much effort you put into your writing. You were also right about people not believing in me. I don’t think it is jealousy or resentment rater I think that where I come from people just can’t think of writing as a real profession. They think that writers only exist in a separate world and that we cannot hope to get there, but I am determined to see this through. If nothing else just for my own satisfaction I will become a writer. The discussion in the comments is something I didn’t expect at all though. I finished reading after learning about old ladies being cloned by beauticians. How did I get here? I don’t know but I’m glad I did. I think the comments section if often better than my posts, LOL :D. I am blessed to have interesting and thoughtful readers. When it comes to writing and writers, I think that there are many perceptions in the world that are completely off base. engaged, and maintaining a level of entertainment. #2 I’ve written a manuscript! I’m done! I’ve experienced this myself, when I wrote my first manuscript. I had the idea that I could send it to publishers, land a contract, and start earning decent money as a writer. Wrong? Oh yes. I *DID* manage to land a publisher, but oh my god, did I have a lot to learn, and I am still recouping my own costs in the process. When the manuscript is written, it generally will not be publishable. As much as we love our work, it will be full of mistakes and i’m sorry to break this to you, but the work has only just begun. With each book we write, we improve as authors… so long as we don’t stick our head in the sand and have a complex that we are just perfect the way we are. #3 I published my book through Createspace. Wow, I’m a published author! OMFG Like, I’m a published author, and like, i’m going to be famous. The train crash called reality is coming, and I don’t think that those “published authors” will see it before it hits. This is the problem with the flood of indie “authors” who publish without taking their craft and work seriously. It also makes it incredibly difficult to find decent work in the haystack of mediocrity. Now, I am not egotistical, and I don’t think that my books are better than everyone elses, but having the discipline and professionalism to make your book publishable will make a world of a difference. Love this statement: “Passion takes the sting out of sacrifice.” And yes, people think I’m nuts because I walked away from a six figure income to follow my passion. I love that every minute of my day is consumed with my passion, my choices, my accomplishments toward my goals. While this may sound selfish, the outcome — the writing — is my gift to others. I LOVE the term, Author CEO!! Fantastic!!! Why I love Steve’s blogs, is he makes it understandable. He is very down-to-earth and I love every post. Writing is about having faith in yourself and what you write, rather than expecting to make a fortune, or seeing yourself at the top of the best-seller list. But we can all dream about the story only we can write; that’s waiting to be told. As for those writing skills; keep polishing and feeling passionate about the one thing thing matters – writing. Getting those words onto the screen, or onto paper is all that matters. A few hundred words a day soon grow into the magical thousands, and before you know it, the first chapter may be in the bag, but even when you call time, thinking you’ve dotted the last (i) and crossed the last (t), there’s that dreaded edit. It is the most difficult task, but one that helps you sort out if what you’ve written is worth turning the page to see what comes next. Loving what you’re doing is all that matters. Blogging opens the possibility of sharing what you want to say with those who might want to read your news and views. If they don’t, no matter, no harm done, but a lot of pent-up frustration can find a positive outlet, and that has to be good. Being true to yourself is key, regardless of what you do. On another note, please check WanaTribe report of Mrs. S***** Please. Already smited her. I check for spammers all through the day, but some slip through and they are FAST. Thanks for keeping an eye out ((HUGS)). I love the header “stickwithitness.” It’s a word my dad uses pretty often, and I have to attribute what little self-discipline I do manage to muster to his parenting. Thanks, as always, for the kick in the pants. Gotta get back to writing! Thank you very much for all your support and welcome information!! I really appreciate it and this post as well is worth so much! Thank you! Your humor, talent and passion are contagious and precious… as is your time (obviously!) Why did you spend so much replying to this? –I will admit I am guilty of the same but just curious?? Gives me a break between work to talk to people, even if they don’t agree with me. I like hangin’ out with you guys :D.
This is perfect. People don’t seem to realize how much work goes into being a writer, most of it isn’t even writing! It’s so important for writers to regard themselves as professionals in order to get anything done. Also, you are one busy lady.